FIND LEAKS FAST IN WATER AND WATER/GLYCOL-BASED FLUID SYSTEMS. Ideal for use in heat transfer fluid system applications. Work effectively in any enclosed circulatory system where fluids are used. Use as part of a diagnostic/preventive maintenance program for industrial systems. Contains more active ingredients per dose than competitive dye. Available in two distinct colors to distinguish among leaking systems. Environmentally friendly and nontoxic to aquatic life. 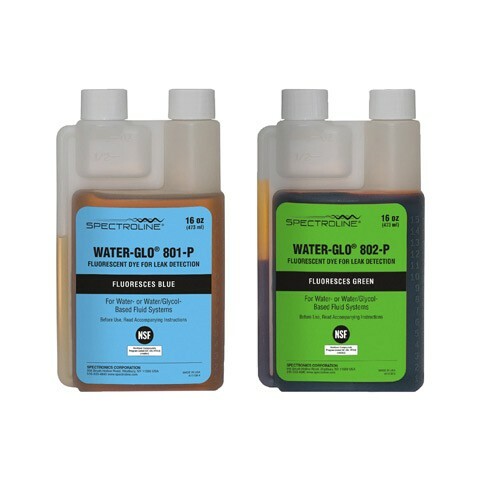 According to Globally Harmonized System (GHS), WATER-GLO is not classified as hazardous.